As if some of the remote gravel roads through the mountains to the west of Marbella were not bad enough, the Volkswagen folk had laid on a pretty spectacular 4x4 obstacle course for journalists from GB and South Africa to try out their latest invention, the Crafter 4x4. 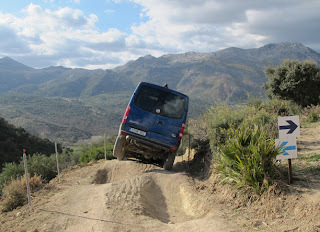 To access it, we had to drive off the main road south of Ronda down into the floor of a valley. That road twisted and turned like a drunk navvy heading home after a serious bevvy with some of the tighter hairpins requiring a bit of shunting to get round. On the way we passed a few bull pens and paddocks where some evil looking little black bullocks eyed us malevolently as we passed disturbing their peace and quiet. Apparently bull fighting is still quite popular in this part of the world and these beasties are bred for fighting, not for eating. Eventually we got to the 4x4 course which clung to the side of the mountain and looked more like a training camp for the Dakar than an off road course for vans. However, the biggest surprise is the capability of the Crafter. The Volkswagen 4Motion system has been enhanced with mechanical locking front and rear diffs, as opposed to the electronic system which the Mercedes-Benz Sprinter favours. But these are horses for courses, the Sprinter’s system is designed more for slippery conditions with camper vans and horsebox towers in mind, whereas the VW transmission has been designed to cope with more extreme conditions, so it would be unfair to compare the two directly. 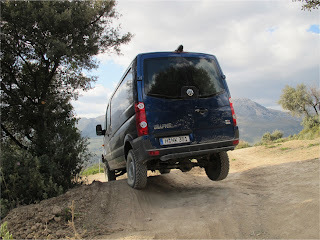 On the other hand, although prices have not been revealed, the AWD Sprinter system will be a lot cheaper than the more rugged Crafter offering. As for the course itself, it was very dusty with lots of soft sand, and although there were no water crossings or boggy bits, it still looked as though the more sadistic Land Rover off-road team had planned the testing climbs, elephant footprints and cambered bends. 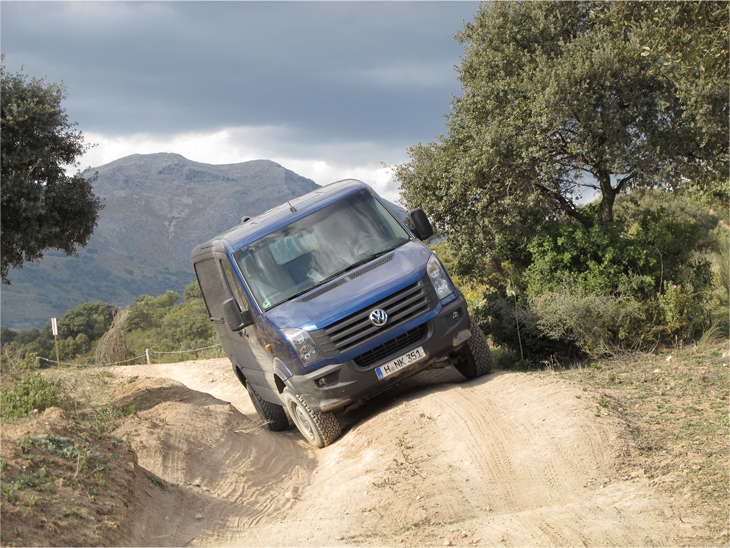 It’s one thing sitting high in a Land Rover tackling this type of extreme off-roading, it’s quite another sitting higher in a big bleedin’ van doing the same things. It was so steep on some of the descents that after selecting Low-Ratio 1st gear to creep down, the driver and passenger had to brace their knees against the dash to stop sliding off the seats on to the top of the dashboard. Wait till the wife sees my bruises from the seat belts, she’ll think I’ve taken a leaf out of Max Mosley’s book! Only once did we need the front diff locked and that was a longish, twisty, very steep uphill climb which was so steep the disturbed sand was running down the hill like rainwater on the windscreen. The Crafter took to it like a flea to a dog and trickled up it like a dozy old mountain goat. No sweat. Making matters worse were the internally air-sprung seats which occasionally worked against the suspension strangling the crew when the seatbelts locked tight! Why anyone would want such a device is open to question, but if there is a need to take a van and kit somewhere that vans are not supposed to go, this will do the trick.